Administrators rely on numerous tools each day to be successful. 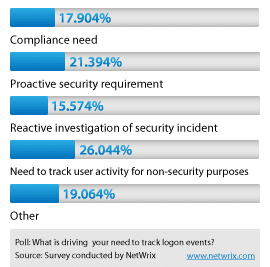 For a quarter of the polled administrators to seek a logon reporting tool for non-security reasons suggests that day-to-day management tasks that are not driven by compliance or security needs require a better solution. Knowing that native tools exist to evaluate these events while still showing interest for a 3rd-party tool to gain greater understanding and maintain historical records of logon events proves that native tools are insufficient for today’s administrators. NetWrix Logon Reporter goes beyond what native tools have to offer and addresses a wide array of demands even when those needs are not driven by security, compliance, or when reacting to a security incident. When using the Logon Reporter, administrators see activity clearly and quickly without having to sort through multiple logs or having to compile into a complete picture. An additional interesting result coming soon – subscribe to NetWrix RSS feed to follow. What motivates you to track and audit logon events? Please share your thoughts below.